As of September 2011, the United States was involved, at different levels, in military operations in Afghanistan, Iraq, Libya, Yemen and Somalia. America has more than 700 military installations overseas , and its military expenses account for almost half of the world’s total . This substantial foreign engagement directly contradicts the United States’ self-professed isolationism in foreign policy. The concept of US isolationism dates back to the colonial days. Evidence for example can be found in Thomas Paine’s work, Common Sense (1776). It was then often reiterated by US leaders, such as Thomas Jefferson and John Quincy Adams, not long after America had gained its independence. Nowadays, characterizations of US foreign policy as isolationist are even further complicated if one moves beyond the field of military intervention and considers the thick web of economic, political, and cultural international relations existing among states. But what about past American foreign policy? Is it sensible to describe it as isolationist? This article analyzes US foreign policy rhetoric to suggest an answer to this inquiry. The term ‘foreign policy rhetoric’ describes the ideas – included in speeches and documents – which characterize American foreign policy discourse. Skeptics may argue that public rhetoric should not be relied on as evidence to support the genuine intentions behind a country’s foreign policy. They believe that public rhetoric is an instrument in the hands of the elites to deceive public opinion and hide the real reasons for a state’s international behavior34. Although this may be the case at times, this argument does not weaken the utility and importance of analyzing public rhetoric in foreign policy. According to the political scientist Michael Hunt, professor at the University of North Carolina, Chapel Hill, “Public rhetoric is not simply a screen tool or ornament. It is also, perhaps even primarily, a form of communication, rich in symbols and mythology and loosely constrained by certain rules. To be effective, public rhetoric must draw on values and concerns widely shared and easily understood by its audience [sic]5.” In other words, if public rhetoric is to be effective, it must be consistent with concerns and values deeply cherished by society. Public rhetoric is, therefore, essential to understanding a nation’s culture and to explaining certain fundamental aspects of its international behavior. 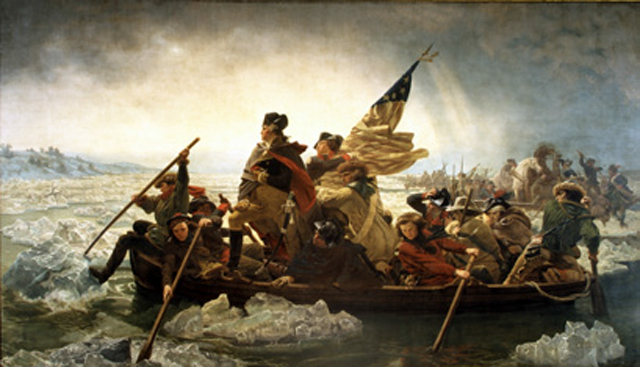 American exceptionalism has been a pervasive theme throughout much of its history. Americans have considered themselves as an exceptional nation with a mission to reshape the world according to its universal values. The idea of US exceptionalism has been characterized by strong religious and secular components. 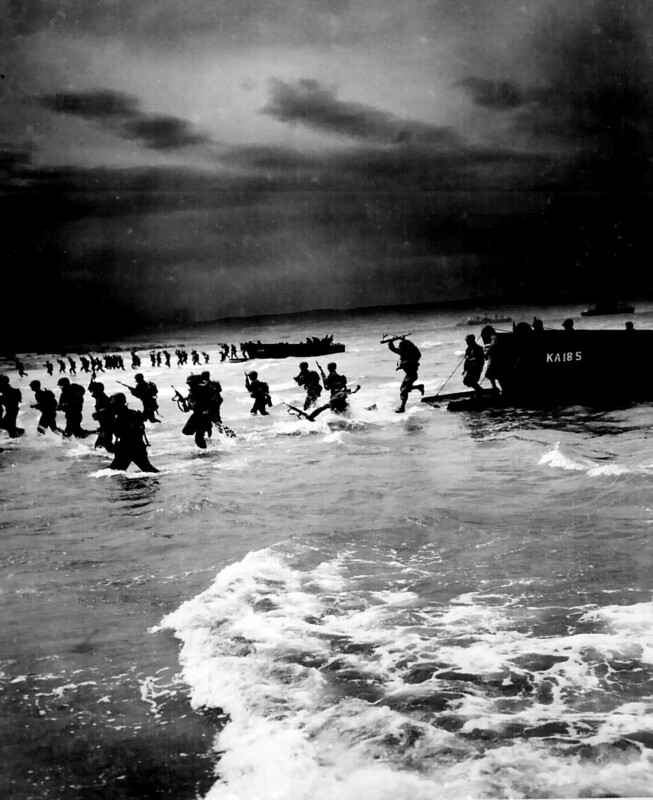 US troops storm a beach in North Africa during World War II. The religious one draws on the beliefs of the first Puritan settlers from England and Scotland. They considered America the ‘New Israel’ and ‘a special religious place’ whose inhabitants were ‘blessed by God’. The secular component of US exceptionalism could be traced back to the age of Enlightenment. It is strongly influenced by the liberal philosophy of John Locke and the political economy of Adam Smith, and grants a special status to the concept of freedom. However, the same kind of widespread consensus has not always been reached on the way in which the United States should pursue this special mission. Can it be done by setting an example? Or does it require direct action? Ever since America adopted this exceptionalist credo, the primary debate over implementation has centered on two competing schools of thought. George Washington warned against foreign entanglements. On the one hand, the ‘lead by example’ strategy calls for restraint in foreign policy. Proponents of this strategy argue that immoderate interventionism in an immoral international system would eventually corrupt the Republican values of the domestic system. On the other hand, the ‘lead by action’ strategy calls for an assertive foreign policy. Democracy and freedom at home are inextricably bound to an active advancement of these American values abroad. As early as 1795, Alexander Hamilton describes the United States as “the embryo of a great empire9.” The narrative of the Manifest Destiny emblematically represents this strategy of action. John O’Sullivan, the American journalist who coined the term in the 1840s, writes that it was “the fulfillment of our manifest destiny to overspread the continent allotted by Providence for the free development of our yearly multiplying millions10.” He also adds “We are the nation of human progress, and who will, what can, set limits to our onward march? Providence is with us, and no earthly power can11.” Although originally framed for the United States’ westward continental expansion, the narrative of Manifest Destiny was later adjusted for US interventions throughout the world12. The existence of two conflicting strategies often gave rise to lively debates and passionate confrontations on issues of foreign policy. The first one took place during George Washington’s administration and revolved around the ratification of the Jay Treaty with Great Britain. Secretary of the Treasury Alexander Hamilton supported the ratification and an assertive foreign policy. Thomas Jefferson, then Secretary of State, was against it and in favor of a foreign policy of aloofness. One of the criticisms moved to the treaty was that overly close economic relations with London would endanger America’s recently acquired freedom. The second confrontation concerned the 1846-48 War against Mexico. It saw President James Polk pushing for the annexation of the Mexican territories of California and New Mexico against the opposition of several members of Congress, both Democrats, as Senator John C. Calhoun, and Whigs, as Senator Joshua R. Giddings. 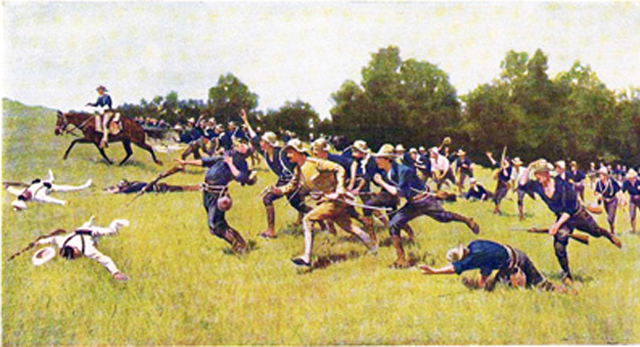 The Spanish- American War of 1898 prompted the third debate. President William McKinley’s project to annex the Spanish territories of Hawaii, The Philippines, Guam and Puerto Rico faced a strong resistance organized by a diverse group of politicians and intellectuals united under the banner of the Anti-Imperialist League. The fourth contest regarded US participation in the First World War. Senators George W. Norris and Robert M. La Follette were two leading voices within the anti-interventionist camp. One strong argument against intervention was that President Woodrow Wilson was taking the United States into war only to serve the interests of Wall Street bankers who had loaned large sums of money to the Entente powers. The onset of the Second World War set the stage for the fifth confrontation between the supporters of the two different foreign policy strategies. Even if we accept the marginalization of the economic aspects of foreign policy, it is still hard to define US behavior in world affairs as isolationist. President Franklin D. Roosevelt and the Century Group favored US intervention, while the organization America First, and its leader Charles A. Lindbergh, strongly resisted it. Finally, it is sensible to accept the argument of the scholar Walter Mead, who set the date of 1947 as the crossing of the Rubicon for this debate13. In fact, President Truman’s enunciation of the Containment Doctrine for the Cold War, that year, sanctioned, once and for all, the predominant status of the ‘lead by action’ strategy in US foreign policy. The strategy of the example did not disappear but markedly lost its power14. However, the persistence of the rhetoric of the ‘lead by example’ strategy throughout US history has largely contributed to the illusion of US isolationism in world affairs, which refers to the illusion of a nation pursuing a restrained foreign policy. In about one hundred years the United States, whether it was through wars, treaties or purchases, tripled the total area of its national territory. This is by no means the record of a nation with a restrained foreign policy. Moreover, an incomplete analysis of three other historical events has fuelled the illusion of US isolationism. These are: President George Washington’s Farewell Address (1796), the enunciation of the Monroe Doctrine (1823) and the US Senate’s negative vote on the Covenant of the League of Nations (1919). The general wisdom holds that in his Farewell Address, President George Washington warns his fellow citizens to avoid “permanent alliances with any portion of the foreign world,” thus promoting a policy of isolation. This is a literal interpretation that does not take into consideration specific historical circumstances of that time. Back then, the United States had recently gained its independence from Great Britain and it was still too weak to meddle in conflicts among the much more powerful European nations. Washington himself later implies – in the same document – the US would adopt a different stance when the circumstances became favorable. He expresses this conviction by claiming that “the period is not far off, when we may defy material injury from external annoyance; when we may take such an attitude as will cause the neutrality we may at any time resolve upon to be scrupulously respected; when belligerent nations, under the impossibility of making acquisitions upon us, will not lightly hazard the giving us provocation; when we may choose peace or war, as our interest guided by justice shall Counsel [sic].” Washington then adds that the US “at no distant period” would emerge as “a great Nation” in world affairs18. In about one hundred years the United States, whether it was through wars, treaties or purchases, tripled the total area of its national territory. President James Monroe’s doctrine is also considered strong evidence for an aloof foreign policy. The document states that “[US] policy in regard to Europe… remains the same, which is, not to interfere in the internal concerns of any of its powers.” Nevertheless, an alternative reading of the same document could describe the United States as still avoiding direct involvement in European affairs because it was aware of its inferior military capabilities, but nonetheless ready to create its own sphere of influence in the Western Hemisphere. Charge of the Rough Riders at San Juan Hill. At the turn of the 20th century, President Theodore Roosevelt gives more credit to this alternative by articulating his Corollary to the Monroe Doctrine: “in the Western Hemisphere the adhesion of the United States to the Monroe Doctrine may force the United States, however reluctantly, in flagrant cases of such wrongdoing or impotence, to the exercise of an international police power20.” Therefore, the Monroe Doctrine was not only a call for the principle of non-interference from European powers in the Western Hemisphere but it also, and perhaps primarily, affirmed the US exclusive duty and right to intervene and direct events in that region of the world. The critics of the ratification argued that such system of collective security would infringe on US sovereignty and unnecessarily reduce its freedom of action. This analysis shows that isolationism has represented a recurrent component of US foreign policy rhetoric. It also conveys that such an isolationist brand of US foreign policy has often competed with a more interventionist one. As a result of successive confrontations, however, the supporters of isolationism have generally ended up on the losing side. Thus, going back to our original question, is it sensible to define past US foreign policy as isolationist? After this assessment, the answer should be no. In fact, it is reasonable to argue that calls for an isolationist foreign policy had and still have an important place in US public rhetoric. But in the past, as for today, these calls were not the main and more potent driver of US foreign policy. Michael H. Hunt, Ideology and US Foreign Policy (New Heaven: Yale University Press, 2009). Thomas Jefferson, Letter to the Earl of Buchan, (1803). Link: http://www.sullivan-county.com/identity/jeff_letters.htm. Thomas Jefferson, Letter to the Citizen of Washington, (1809). Link: http://www.sullivan-county.com/identity/jeff_letters.htm. John Quincy Adams, Address on US Foreign Policy, (4 July, 1821). Link: http://www.Presidentialrhetoric.com/historicspeeches/adams_jq/ foreignpolicy.html. Alexander Hamilton, “The Defence no. 2,” The Camillus Essays, (25 July 1795). Link: http://oll.libertyfund.org/?option=com_ staticxt&staticfile=show.php%3Ftitle=875&chapter=63946&layout=html&Itemid=27. John L. O’Sullivan, “Annexation,” The United States Magazine and Democratic Review 17, no. 1, (July 1845): 5–10. John L. O’Sullivan, “The Great Nation of Futurity,” The United States Democratic Review 6, no. 23, (November 1839): 426-430. Stephen Kinzer, Overthrow, (New York: Times Books, 2006). Russell W. Mead, Special Providence, (New York: Routledge, 2002). US general public may be less interventionist than the foreign policy elite is. However, there is not clear evidence of that. Paul Kennedy, The Rise and Fall of Great Powers, (New York: Vintage Books, 1987). Albert J. Beveridge, April 1897, quoted in William A. Williams, The Tragedy of American Diplomacy, (New York: Norton, 2009), p.28. Theodore Roosevelt, “Expansion and Peace,” The Independent, (December 21, 1899). George Washington, The Farewell Address speech, (September 19, 1796). Link: http://www.pbs.org/georgewashington/milestones/ farewell_address_read4.html. James Monroe, State of the Union Address, (December 2, 1823). Link: http://www.Presidentialrhetoric.com/historicspeeches/monroe/ stateoftheunion.1823.html. Theodore Roosevelt, Annual Message to Congress, (December 6, 1904). Link: http://oll.libertyfund.org/?option=com_ staticxt&staticfile=show.php%3Ftitle=2282&chapter=216461&layout=html&Itemid=27. Michael H. Hunt, Ideology and US Foreign Policy, p.137. William A. Williams, The Tragedy Of American Diplomacy, p.110. Covenant of the League of Nations, 1919-1924. Link: http://avalon.law.yale.edu/20th_century/leagcov.asp.